One can't talk about Las Vegas dining without the name Wolfgang Puck tripping on their tongue. With six restaurants on the Strip-Wolfgang Puck Bar & Grill, Chinois, Postrio, Riva, Spago and Trattoria Del Lupo—it's easy to see why the man's name is synonymous with Vegas. Of course, it's also synonymous with California cooking, as Puck integrates the freshest of ingredients in his dishes, even in the desert. 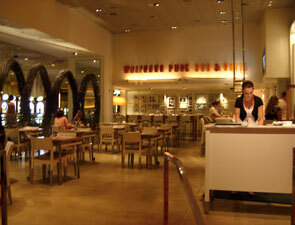 Wolfgang Puck Bar & Grill is no exception. A modern bar and grill designed by Tony Chi, this casino-based restaurant provides an easy excuse to walk away from the tables for some libation and sustenance. And after your meal you can get right back to gaming, if you so desire. 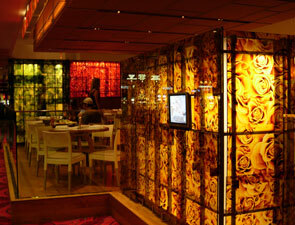 The restaurant's decor is that of a relaxed California eatery, with garden images throughout. Not a bad place at all to take a break from the sounds of card shuffling and slots.